Purchased from the artist by Wallis, August 1874 (£155). with The French Gallery, London. Capt. Reid-Walker (according to an inscription on the reverse). The artist's own sale records, 1874. Possibly London, Royal Academy, 1874, no. 505. Leader depicts the river Llugwy as it winds its way south from below Capel Curig. The artist had taken sketching holidays in North Wales on an almost annual basis from the late 1850s until 1889. 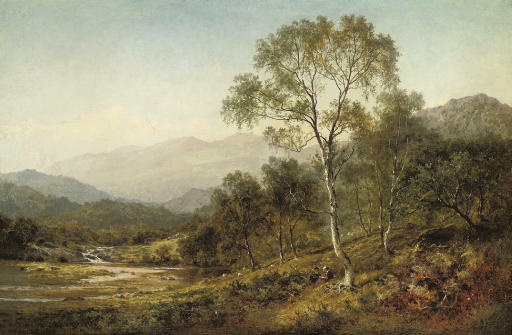 The landscape around Capel Curig and Bettws-y-Coed was greatly favoured by professional and amateur artists; the rivers Llugwy, Lledr and Conway, which coursed through the narrow valleys overlooked by mountain ranges provided a wealth of good subject matter. We are grateful to Ruth Wood for her help in preparing this catalogue entry. Mrs Wood is working on a catalogue raisonné of the paintings of Benjamin Williams Leader.